February 29th, 2016 is Rare Disease Day – a day slated to create crucial awareness around the more than 7,000 rare diseases that are estimated to affect 30 million people in the U.S. alone. FTD, or Frontotemporal Degeneration, is a rare disease, affecting an estimated 50,000 to 60,000 people in the United States. Working together, AFTD is featured within Mediaplanet’s latest cross-platform campaign, responding to challenges facing the rare disease community. 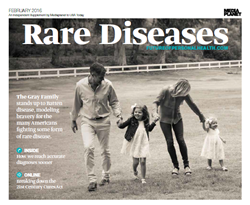 The print component of “Rare Diseases” is being distributed within the February 29th edition of USA Today in New York, Chicago, Houston, San Francisco and Boston, with a circulation of approximately 250,000 copies and an estimated readership of 750,000. The digital component is distributed nationally, through a vast social media strategy and across a network of top news sites and partner media outlets. To explore the digital version of the campaign, click here. Frontotemporal degeneration (FTD) is characterized by progressive atrophy of several different areas of the brain, particularly the frontal and/or temporal lobes, the parts of the brain that control “executive functions” such as decision-making, personality, social behavior and language. Clinical diagnoses include behavioral variant FTD (bvFTD), primary progressive aphasia (PPA) which affects language, the movement disorders progressive supranuclear palsy (PSP) and corticobasal degeneration (CBD), and FTD-ALS (FTD-amyotrophic lateral sclerosis). To mark Rare Disease Day, Mediaplanet enlisted help from The Association for Frontotemporal Degeneration (AFTD) and other organizations, to increase awareness of the challenges that individuals and families impacted by rare diseases face, while establishing a more powerful and unified voice across the rare disease community. AFTD is a Radnor, PA-based national nonprofit working to improve the quality of life of people affected by Frontotemporal Degeneration (FTD) and to drive research to a cure. For more information, visit http://www.theaftd.org, or connect via http://www.facebook.com/TheAFTD or http://www.twitter.com/AFTDCure. This campaign was made possible with support from The Association for Frontotemporal Degeneration, a nonprofit dedicated to improving the quality of life of people affected by FTD. Their mission is to work toward a world where frontotemporal degeneration is understood, effectively diagnosed, treated, cured and ultimately prevented.